50K MUSIC: Who had the idea to name the band Keemosabe? Is there a story behind? Keemosabe: The word KEEMOSABE means “brothers from different mothers” in Comanche. Andrea (our keyboard player) came out with this idea and we really liked it. We deeply respect native American culture in general, and we feel really close to their way of thinking, especially in terms of their spiritual view of nature. 50K MUSIC: Please outline what everyone also has to know about Keemosabe. Where do you come from, what are your musical roots? 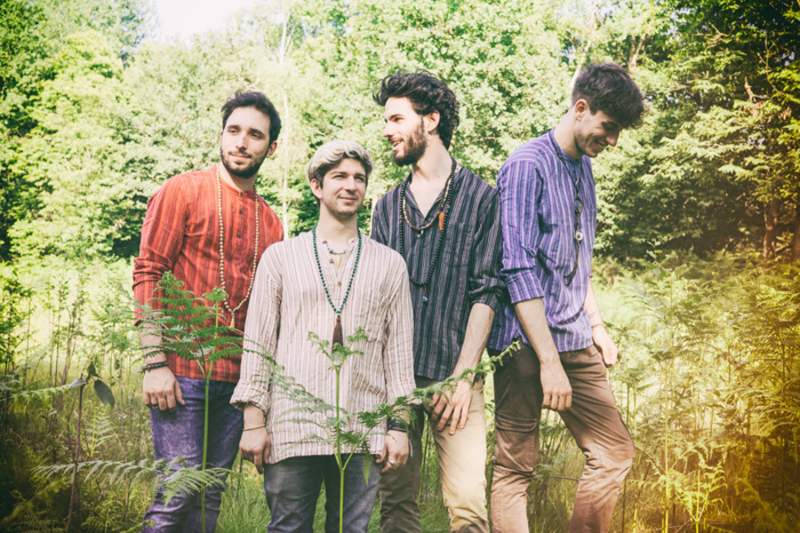 Keemosabe: Our project was born from the desire of two jazz students in New York City, Alberto Curtis and Sebastiano Vecchio, to form a pop/rock band that could implement concepts from different musical genres. After meeting Pino Muscatelli, an Italian rock session man and Andrea Guarinoni, a soundtrack composer/producer, the music that derived is a hybridization of various musical landscapes, enriched by deep grooves, heavy riffs and pop melodies on top. We formed the band in Italy and we spent months writing music together in a home studio lost in the Italian countryside. This helped us in shaping our musical vision and identity, that deals with reconnecting human beings to nature. Nature has opened our hearts, quieted our minds and transformed our creative imagination. We want to honor the music that we grew up with (Rock, Pop, Blues and Funk records), introducing original ideas. We are not aiming for something new, but we are trying to sound like ourselves, therefore unique. 50K MUSIC: … and what’s #followthesymbols about? Keemosabe: Last summer we met this amazing woman from Holland called Ylva. She spent one day in our home studio and she decided to draw four symbols that would reflect our personalities. We loved this idea and we decided to make this symbols a part of our identity as a band. We started using the hashtag #followthesymbols and everyone got really curious about its origin. We will reveal the whole story behind it when the right moment comes! 50K MUSIC: The Kickstarter campaign you’ve just started seems to run quite well. What were the reasons for you to use crowdfunding to fund your first album? Keemosabe: We love the idea of crowdfunding! First of all, we consider this campaign a great opportunity for us to spread the word about our project, how we dream about making a living with our music and how we would love to bring KEEMOSABE around every corner of the world. Kickstarter gives us the chance of sharing all of this with whoever feels emphatic about our vision of life and music and wants to give a small help to make this happen. It is priceless to see how people can gather and take an idea they believe in, out into the world! 50K MUSIC: … and what feedback did you get from your fans so far? Keemosabe: It seems like people are understanding the passion that we are putting behind it, as we reached 70% of our goal in just 10 days. We are so grateful about it! The path is still long, but we are positive that we can reach our goal. We feel really privileged about being able to pursue this career in music and we would love to share as much as we can with whoever believes in what we do. 50K MUSIC: What exactly will you use the funds for? Keemosabe: We will use part of the funds to record, mix and master our first EP in the most famous recording studio in the world, Abbey Road Studios in London. It is the home of countless landmark recordings, and has played an integral role in the evolution of modern music. It would be a dream come true to be able to record in there! On the other hand, we firmly believe that LIVE MUSIC is still one of the most powerful ways of conveying a message and one of the most exciting experiences in human life, and this why we are planning to empower our live setup with new gear. In this way, we will have a unique live show and it will also be possible to record in high quality and stream our concerts all around the world, on multiple platforms. 50K MUSIC: And when do you think fans will hold the debut album in their hands? Keemosabe: Everyone who is making a pledge on our Kickstarter campaign, will have the privilege to listen to our first EP exclusively, with a digital download, from the month of August 2017. We are planning to release it officially in November 2017. 50K MUSIC: What about touring? Do we have the chance to see Keemosabe live on stage this summer or after the album release at the latest? Keemosabe: Absolutely! We love playing live and we will perform in multiple venues and festivals around the area of London (that’s we’re we are currently based), throughout the whole summer. You can check our website www.keemosabeband.com for further information about our concerts. If you’re not going to be around London, keep an eye on our Facebook page! We are often streaming live videos of our concerts. An official tour in different areas of the world for the promotion of our EP is one of our stretch goals if we go over 100% of our goal! 50K MUSIC: And last one: anything you want your backers and fans to know?